I have recently had the opportunity to look through various things of mine which have been in storage since the very end of 2003, when I sold my house to go travelling to India and elsewhere. I found this video which is a clip from Sky News from March 2000, reporting on the launch of the first pre-paid wap phone in the UK. At the time, I was head of music and games at Genie Internet, a subsidiary of BT Cellnet (Now O2) of which I was one of the co-founders. This clip is interesting to me as I am talking about the convergence of music and mobile, a year before the first iPod, and Apple were simply not on the radar at this time. Also, in 2000 the key driver of content partnerships between mobile portals and networks such as Genie and content providers was access to the customer base of the mobile networks. Social networking also had not entered into the arena. I still have my old Nokia 2110 phone, which you can see in a recent photo I took of it. 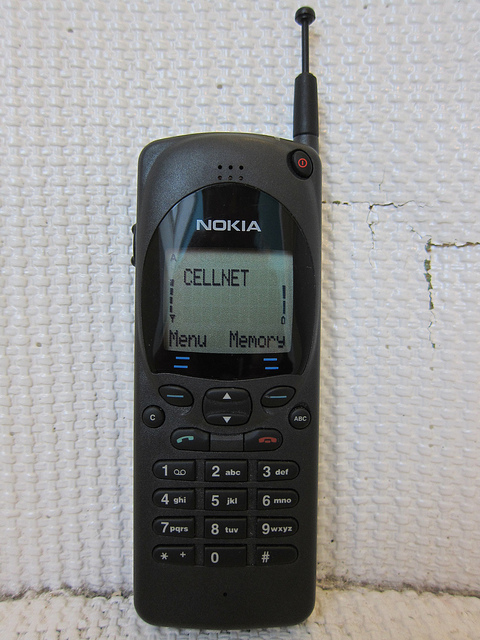 It still says Cellnet rather than O2, and it is still very much working. This I would say was the iPhone of it’s day, with its gorgeous graphical user interface which was infinitely more intuitive than the previous generation of mobile phones with no screens, and where you had to use a function key, assuming you could remember what all the different functions were. I guess it is a little ironic, as although in my late 20s as Business Development Manager for smart phones at BT Cellnet I always had the latest mobile, sent to me from all the handset manufacturers, nowadays I have a phone with not much more functionality than the original 2110. Anyway, it’s funny how times change. At school no one had a mobile phone, they were still just yuppie toys, but things have shifted massively since the turn of the millennium. Nowadays I am far less technology focussed, and in fact I sometimes describe myself as Simon 2.0. May we live in interesting times.